Alopecia is the term used to describe partial or full hair loss. It occurs on men and women alike. For both sexes, alopecia can cause psychological distress due to its impact on appearance and self image. This is an even bigger issue in today’s society which holds unrealistic and unattainable beauty standards, and bombards us with the ‘ideal’ of beauty on a daily basis. That’s why we love this campaign called #Alopeciaisfashion, originally aired on BBC Radio 5 Live, which aims to make the condition more accepted in the world, challenge widely held perceptions about beauty and set new standards by giving a platform for models who’ve suffered hair loss. Ultimately, it’s about getting other people with alopecia to feel confident by showing how everyone is beautiful in their own way regardless of whether they have hair or not. 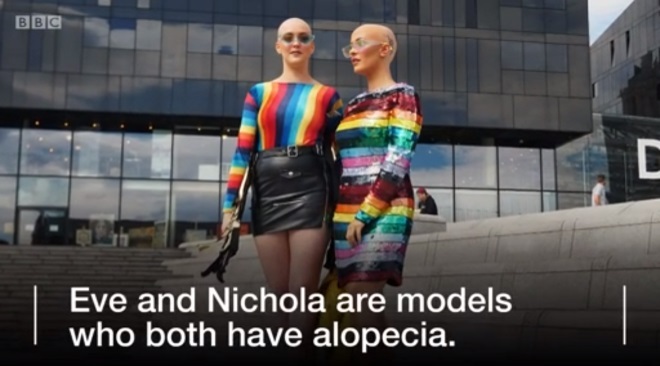 When you consider that alopecia is estimated to affect 8 million people in the UK alone, according to NHS figures, the #Alopeciaisfashion campaign is a positive step forward in questioning the belief that the epitome of attractiveness is size zero, tall with long hair. Watch the 2½ minute video clip here. To digress slightly, alopecia has many causes including hereditary reasons, the result of stress and symptom of an underlying medical condition. The extent of hair loss and regrowth varies greatly from person to person. What’s lesser known is that balding hair can also be the unfortunate outcome of a hairdressing appointment gone wrong. We’ve written previously about the impact of misuse of hot styling equipment, improper application of chemicals and general lack of care on the part of hairdressers. If you find yourself in this situation and experience hair loss as a consequence of a visit to the hairdresser’s, help is available in the form of our expert legal team. We’re specialists in claims against hairdressers. With our support, you can secure compensation reflecting both physical and psychological damage incurred. Contact us in confidence today. Our initial consultation is completely free. Email enquiries@hairdressingclaims.co.uk, call 0800 970 9102 from a landline for free, phone 0333 202 6560 from a mobile or complete our online enquiry form.